Food counterfeit is a major issue for food industries. In the case of wines, there can be multiple forgeries such as geographical, vintage, or varietal mislabeling. 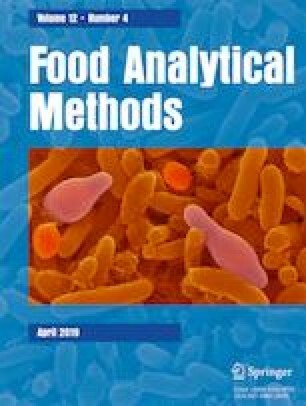 For the last 10 years, the use of quantitative 1H NMR (q-NMR) for food authentication has experienced an enormous increase. This study was based on a comparative evaluation of the results obtained for three sets of authentic high-valued wines and suspected wines. Two methodologies have been followed: (i) the usual wine analysis, based on the utilization of multiple techniques, which is the traditional way of analysis for wine authentication and (ii) q-NMR profiling, the alternative proposed method. For wine comparison, an original approach based on similarity score (S-score) by analogy to the Z-score calculation was developed. A limit of four S-scores outside the range − 2/2 has been, arbitrary, defined to reveal that wines are different using q-NMR analysis. Data treatments allowed the extraction of discriminating parameters, some of which were common to both approaches while others could be linked to the techniques’ capabilities showing the complementarity of the two approaches. This study demonstrated the potential of q-NMR in wine authentication by comparative analysis with authentic samples. The q-NMR alternative method has also the advantages of rapidity (around 20 min including sample preparation, analysis, and data treatment) and low volume (0.5 mL), which is a prerequisite for analyzing priceless wines. The online version of this article ( https://doi.org/10.1007/s12161-018-01425-z) contains supplementary material, which is available to authorized users. Château Mouton Rothschild is warmly thanked for their authorization to publish these results. The authors thank the SCL’s team of Bordeaux-Pessac for performing usual analysis: Laetitia Gaillard for stable isotope analyses; Ludovic Pottier, François Auger, Claude Roux, and Nathalie Diet for ICP-AES; Carole Lagrèze and André Domec for HPCE; and Rodolphe Robin, Maryse Viateau, and Sebastien Raud for GC and standard wine analysis. Josep Valls-Fonayet (ISVV) is greatly acknowledged for his comments and advises. This study is financially supported by the Conseil Régional d’Aquitaine, the Conseil Interprofessionnel du Vin de Bordeaux (CIVB), and FranceAgriMer program. The work was supported by the Bordeaux Metabolome Facility and MetaboHUB (ANR-11-INBS-0010 project). Louis Gougeon declares that he has no conflict of interest. Gregory Da Costa declares that he has no conflict of interest. Tristan Richard declares that he has no conflict of interest. François Guyon declares that he has no conflict of interest. OIV a Compendium of international methods of analysis: alcoholic strength by volume.-OIV-MA-AS312-01A at http://www.oiv.int. OIV b Compendium of international methods of analysis: dosage of sugars in wine by HPLC. OIV-MA-AS311–03 at http://www.oiv.int. OIV c Compendium of international methods of analysis: volatile Acidity. OIV-MA-AS313–02 at http://www.oiv.int. OIV d Compendium of international methods of analysis: analysis of volatile compounds in wines by gas chromatography. OIV-MA-AS315–27 at http://www.oiv.int. OIV e Compendium of international methods of analysis: determination of the principal organic acids of wines and sulphates by capillary electrophoresis. OIV-MA-AS-313-19 at http://www.oiv.int. OIV f Compendium of international methods of analysis: analysis of mineral elements in wines using ICP - AES (inductively coupled plasma / atomic emission spectrometry). OIV-MA-AS311–05 at http://www.oiv.int. OIV g Compendium of international methods of analysis : determination of the deuterium distribution in ethanol derived from fermentation of grape musts, concentrated grape musts, grape sugar (rectified concentrated grape musts) and wines by application of nuclear magnetic resonance (SNIF-NMR/ RMN-FINS). OIV-MA-AS311–05 at http://www.oiv.int. OIV h Compendium of international methods of analysis: determination by isotope ratio mass spectrometry 13C/12C of wine ethanol or that obtained through the fermentation of must, concentrated musts or grape sugar. OIV-MA-AS312–06 at http://www.oiv.int. OIV i Compendium of international methods of analysis: method for 18O/16O ratio determination of water in wines and must. OIV-MA-AS2–12 at http://www.oiv.int. OIV j Compendium of international methods of analysis: method for sulfur dioxyde. OIV-MA-AS323-04A at http://www.oiv.int.